A year after a Detroit Tigers rookie named Mark “The Bird” Fidrych won 19 games and the American League Rookie of the Year award in 1976, Detroit found another rookie phenom in Dave “The Rose” Rozema, giving them two right-handed starters who were, as the press wrote prior to Opening Day, “pitchers you can build a staff on.” Oh, to think what might have been. “Because I’m big and tall,” Rozema said, “people think I should gun the ball. But I don’t. That’s not my style ... basically, I throw a lot of changeups and rely on groundballs.” And he employed that strategy to great success, leading the 1977 Tigers’ pitching staff with 15 wins. No other pitcher won more than eight. Grand Rapids is where David Scott Rozema was born, on August 5, 1956. It’s also where he was raised and first came to the notice of major-league scouts. At Central High School, Rozema was an All-City selection in his junior and senior years, and when he graduated in 1974, he was drafted and offered a contract by the San Francisco Giants. When the Giants wouldn’t offer him a bonus, Rozema declined their offer. He was, after all, a 22nd-round draft choice. Selected in the fourth round, Rozema signed with Detroit on January 21, 1975, and this time he received a bonus, $2,500. Then he was instructed to report in March to the Tigers’ Lakeland, Florida, rookie camp for assignment. Rozema began his professional career in the Class A Midwest League, playing for the Tigers’ affiliate in Clinton, Iowa. Beginning the season as a reliever, the right-hander quickly established himself as one of the best in the league. On May 14, 1975, the Cedar Rapids Gazette reported on an 8-7 come-from-behind victory by the Cedar Rapids Giants over the division-leading Clinton Pilots. Scoring three runs in the bottom of the seventh inning, the Giants “victimize(d) ace Clinton relief pitcher Dave Rozema, who had a flashy 1.12 ERA and 2-0 record entering the game.” Later in the season Rozema moved into the starting rotation, and on July 27 he defeated the Waterloo Royals, 11-1, allowing only five hits, although he had a one-hitter through the sixth inning. By season’s end, Rozema had produced a 14-5 record and impressive 2.09 earned-run average while making 19 starts in 27 games. He had also learned to throw what became his signature pitch. Interviewed during his rookie year, Rozema said, “I’ve always had a good fastball and slider, but I think I became a pitcher in my first year in the minors. John Grodzicki, the Tigers minor-league pitching instructor, taught me how to throw a changeup. Now it’s one of my favorite pitches.” It soon made him one of the best rookies in the major leagues. Based on his success in the Midwest League, in 1976 the Tigers invited Rozema to spring training as a nonroster player. On March 31 he was one of eight players cut from Detroit’s spring training squad, and shortly thereafter was ordered once again to report to the minor-league camp for reassignment. As expected, Rozema made the rotation. As well as the rookie had pitched, however, Houk declined to name “The Rose” his starter on Opening Day, scheduled for April 7 in Detroit against Kansas City. Four days later, on April 11, in Toronto, against the expansion Blue Jays, Rozema finally made his debut. He pitched well, too, although he left the game without a decision. “Tiger Rookie Looks Good ...” ran the headline the next day in the Record-Eagle in Traverse City, Michigan, about two hours from Rozema’s birthplace, “but Jays Win.” After breezing through the first six innings with a 3-1 lead, Rozema had allowed only seven hits and one run when, with a runner on third base, he committed a balk. “I was just holding the ball nice and loose, and I just hit my leg and the ball fell out,” he said -- and allowed the runner to score. Houk immediately relieved the rookie, who the manager said had “pitched real good up to that point,” and the Tigers eventually lost, 5-3. Nonetheless, it had been a promising appearance by the righty, and he didn’t have long to wait for his first major-league victory. Indeed it wasn’t. Rozema went on to win 14 more games for the Tigers in his rookie season while losing only seven, and posted the seventh best ERA in the league, 3.09. In 28 starts he totaled 218 innings and completed 16 games, and walked only 34 batters the entire season. During one stretch, from July 16 to August 19, he won seven consecutive games. Rozema was particularly effective against the Milwaukee Brewers; in four starts, he won four times and threw four complete games. After the rookie’s final victory over Milwaukee, in August, Brewers first baseman Cecil Cooper summed up Rozema’s performance this way: “He throws junk. But it’s hard to hit because you don’t see that kind of junk very often. He threw me one pitch tonight that I couldn’t even tell what it was. I couldn’t even tell if it had rotation. I think he just grabs the ball with five fingers and throws it. ... He gets you to swing at what he wants you to swing at. He’s tantalizing.” There were a lot of equally tantalized American League batters that summer when Dave Rozema pitched. For all that the right-hander accomplished, however, there was also one ominous sign: Injuries soon took their toll on Rozema’s shoulder. In July, he suffered a three-week bout of tendinitis that caused him to miss several starts, and when the soreness returned early in September, he sat out the final three weeks of the season. Unfortunately, though, Rozema had peaked and injuries were primarily to blame. After defeating Texas 6-2 in his first start of 1978, a complete-game four hitter, the stiffness in his pitching shoulder returned, and he was forced to miss a start on May 18. Then, three days later, he left a game after only four innings, again complaining of similar discomfort. Finally, after missing three weeks, he had a cortisone injection in June, and finished the season a 9-12 record. But apart from the win-loss mark and injury, his stats closely matched the year prior: 209 innings pitched, a 3.14 ERA, 28 starts, almost identical WHIP (walks plus hits per inning pitched, 1.173 and 1.175) -- and a lot fewer home runs (17, down from 25) allowed. In 1979, Rozema’s injuries worsened. Despite two brilliant performances, a complete-game three-hitter versus Toronto at Tiger Stadium on April 22, in which Rozema threw just 88 pitches and took a no-hitter into the sixth; and a five-hit, 2-0 shutout in Oakland on June 3, the right-hander was sidelined for nearly three months with a recurrence of his shoulder pain. In all, he appeared in just 16 games, all starts, and totaled only 97 innings for the season, posting a 4-4 record and 3.51 ERA. After the season he went to the Florida Instructional League and, for the first time, worked on a weight program in an effort to improve his arm strength. All of this impressed new Tigers manager Sparky Anderson. As spring training got under way in 1980, Anderson, who had replaced the fired Les Moss the previous June, said: “(Rozema) got hurt the first day I was manager. He could have come back for the last two months. I could have pitched him. ... But we weren’t going anywhere, so why take the chance.” Anderson told the press that Rozema’s injury the previous season had been “only a strained muscle.” This spring, he appeared to be stronger. Yet Rozema didn’t immediately endear himself to the skipper. In the fall, Anderson had set maximum weight limits for all his players; for each pound above their limit, they were fined $100. Rozema came to camp three pounds over his limit, so Anderson fined him $300. But that wasn’t Rozema’s last mistake. Over the course of his career Rozema would gain a reputation for some notable off-the-field incidents. One of those took place in March 1980. With two spring training games scheduled to be played in Puerto Rico, the Tigers boarded a plane for the flight to San Juan -- but Rozema wasn’t on the plane. As it turned out, the pitcher had stayed out late the night before judging a wet T-shirt contest and overslept. After catching the next plane, Rozema was installed that night as the starter against the St. Louis Cardinals. In four innings, he allowed seven hits and six runs, and the Tigers lost, 11-0. Despite the pounding in Puerto Rico, at the conclusion of spring training Anderson named Rozema a starter for the regular season. It was a short-lived assignment. For the first three weeks Rozema was the team’s most consistent pitcher, with a 2-2 record in six starts. Then, in his next two starts, he lasted just 4? innings. Suddenly, after 78 starts in four seasons, Rozema became a relief pitcher. Save for a few more starts, he remained in the bullpen the rest of the year. On June 11, though, in his first start since being demoted, he faced Minnesota in Detroit and was shelled, allowing seven hits in a 9-5 loss. When he left the game in the fifth inning, the crowd booed him. After the game, catcher Lance Parrish told reporters that Rozema had “lost his changeup.” “For Rozema to be as effective as he once was,” Parrish said, “he has to come up with the changeup that he once had. When he was a rookie he had one of the best changes in baseball. But now it just hangs there.” With a final record of 6-9, an ERA of 3.92, and only 13 starts in 42 games, Rozema’s days as a front-line pitcher appeared over. In the spring of 1981, Rozema battled for a spot on Anderson’s 10-man pitching squad. The 24-year-old “has[n’t] much chance of getting back into the rotation,” wrote the Ironwood Daily Globe, but Rozema said he’d accept a bullpen role. “I don’t feel like my career is on the line,” he said. “As long as I can help win these games, I feel like I have a purpose. I don’t want to feel left out. You can have a good life this way, too.” In a total of 28 games he did make nine starts, and one was quite memorable. In an outing that Rozema afterward called “the best game of my career,” he pitched a complete game two-hitter in Seattle to break Detroit’s 10-game losing streak, allowing only three Mariners to reach base and retiring the last 14 batters he faced. At season’s end he had split 10 decisions and posted an ERA of 3.63 in 104 innings pitched. So he went to spring training in 1982 hopeful of resurrecting his career. He had a great reason to be optimistic: During the offseason, Rozema had received a three-year contract for $510,000. Again, though, his spring began inauspiciously. Training camp had just got started when Rozema and teammate Kirk Gibson went out one night to a local saloon. The next morning it was reported that Rozema had required 11 stitches in his right buttock after Gibson had kicked a chair from beneath Rozema as “The Rose” tried to sit down: When he landed, a bottle of medicine he kept in his hip pocket shattered and cut him in four places. Then, on April 6, the evening before his first start, Rozema playfully shoved teammate Alan Trammell when the two visited a local nightclub. As Trammell ducked to avoid the shove, the shortstop struck his face on the rim of a beer mug and required some 40 stitches to close a gash in his forehead. Those turned out to be mild accidents, though, in comparison to what happened on May 14. On the mound, Rozema was off to his best start in several years; in eight games, including two starts, he had compiled a 3-0 record and a 1.63 ERA. Then, in Detroit, he prematurely ended his season. In the 11th inning of an eventual 4-2 Tigers victory, a brawl broke out while Detroit was at bat. Rozema, who was the Tigers’ pitcher of record at the time, wanting to “be out there protecting my guys,” ran from the third-base dugout and entered the brawl feet-first. When he came down near the mound his left knee buckled, and he had to be carried off the field on a stretcher. At the hospital it was determined that he had suffered damage to all but one ligament in his knee, as well as severe cartilage damage and a broken kneecap. The next day surgeons spent five hours repairing the damage, and Rozema was placed on the 60-day disabled list. In fact, he still had a few good seasons left. 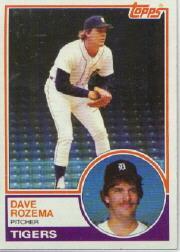 In 1983 Rozema made a solid recovery, appearing in 29 games and tossing 105 innings, including 16 starts. Beyond his record of 8-3 and ERA of 3.43, he had the most strikeouts (63) since his rookie season, and walked only 29. The next season, when the Tigers won the World Series, his numbers were almost identical: 29 games, 16 starts, 101 innings pitched and 48 strikeouts, with a meager 18 walks allowed, although his record fell to 7-6. By July of 1984, as a result of his 1982 knee surgery, Rozema was, wrote the press, “a 27-year old sore-legged pitcher without overpowering speed or stuff.” With a 7-1 record on July 24, he finished the season 0-5, and during the World Series failed to make an appearance. Yet it never really worked out for Rozema in Arlington. Fifteen years later he reminisced for a reporter that “Texas was a ‘nightmare.’ We just didn’t have the caliber of team needed to compete. We had a decent team on paper, but we couldn’t win. It was like we always just found a way to lose games. It just wasn’t happening for us.” In 1985, he pitched in 34 games, all but four in relief, and posted a 3-7 record and 4.19 ERA in 88 innings; and in 1986, six days after being ejected from a game against Cleveland for arguing with the umpire, Rozema was released by Texas after appearing in six games and pitching 10 innings. And just like that, after 248 major-league games, 60 wins and 53 losses, his major-league career was over. On May 20, 1986, Rozema was signed by the Chicago White Sox. He never pitched at the major-league level, however; in 13 games, he made 11 starts for Chicago’s Triple-A affiliate, the Buffalo Bisons, and split eight decisions in 68 innings. In 1987, he appeared in seven games (five starts) for the Maine Guides, the Philadelphia Phillies’ International League entry, and was 3-0 with a 2.92 ERA. Finally, in spring training of 1988 Rozema made several relief appearances for the Phillies, but was sent to their minor-league complex on March 18, and didn’t pitch again for a major-league affiliate. He had one last competitive trip to the mound, however: In 1990, Rozema pitched three games for the St. Petersburg Pelicans of the Senior Professional Baseball Association and compiled a record of 2-0 before the league folded. And then his career was truly over. With his playing days ended, Rozema returned to Detroit to live and work. Just before Christmas of 1985, he had married Sandy Sklarski in a double ceremony with onetime teammate and still best friend Kirk Gibson, who married Sandy’s sister JoAnn. Eventually, Rozema took a position as a salesman with Diagnostic Imaging, a medical X-ray company. “We’ve got a lot of different products that we sell,” he told Sports Collectors Digest in 2000. “I enjoy it.” In his spare time he also enjoyed golf and fishing. Though he never played golf during his playing days, he became very good at the game, eventually playing to a seven handicap and often playing golf with his wife. Rozema maintained his ties to baseball, too. He remained very active with the Tigers organization, and could occasionally be heard on TV and radio. He also frequented the ballpark. He had come a long way since Central High School in Grand Rapids. Just how far was acknowledged in 2001, when Rozema was inducted into the Grand Rapids Sports Hall of Fame. As of 2008, there were 110 inductees; athletes, owners, and coaches from West Michigan who have achieved prominence in their sports on a local, state, or national level. In addition to Rozema, Jim Kaat, Mickey Stanley, and Wally Pipp are among other baseball players previously inducted. For the tall, slender rookie known as “The Rose” that’s rather select company. My thanks to Chuck Ailsworth, Society for American Baseball Research, for some minor-league statistical data.